$128.122 million on 4380 screens. With the enormous financial success of 2008’s Iron Man, a sequel became inevitable. Thus 2010 brought us Iron Man 2, a flick that almost literally duplicated the box office take of its predecessor – and set up 2013’s Iron Man 3. I liked but didn’t love Iron Man, so I was curious to see if the initial sequel would make me more invested in the franchise. In a prologue that takes place at the same time as the prior film’s final scene, we meet Ivan Vanko (Mickey Rourke), a Russian whose father Anton (Eugene Lazerev) co-created the reactor at the core of the Iron Man suit. Alas, billionaire mogul Tony Stark’s (Robert Downey, Jr.) father Howard (John Slattery) got all the fame and success, which leaves Anton to die in poverty and anonymity. This sets Ivan on a path of revenge. Six months later, we learn that Stark’s escapades as Iron Man ushered in an era of world peace, though not without controversy, as the US government wants him to turn over the suit for military weapons usage. He refuses but this doesn’t settle the issue, especially since rival arms maker Justin Hammer (Sam Rockwell) badly wants to get the technology for himself. Tony has other problems, as the arc reactor that keeps him alive creates a toxic reaction that slowly poisons him. In addition, when Tony indulges in an auto race, Ivan Vanko emerges in his own mechanized suit and attacks our hero. We watch as Stark deals with all of these challenges as well as other complications. When I go into a superhero flick that must give us an “origin story”, I fully understand that it’ll take a while for us to get to the action. This is inevitable, as we need to wait until the hero has come into being. 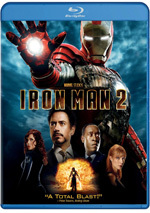 Sequels come free from such shackles, but you wouldn’t know that from Iron Man 2, as it tends to avoid much use of the title character for large portions of its running time. Sure, Iron Man shows up early at the Stark Expo, but that’s just a flashy tease; we get no actual Iron Man action until more than 25 percent into the flick. And even then, we don’t get substantial Iron Man-related mayhem; the auto race scene gives us a decent punch but it ends quickly. Other than a quick Stark vs. Rhodes dual-Iron Man fight about half an hour later, we must wait until the final fourth of the flick for more considerable slam-bang material. No, I don’t insist on constant action, but Iron Man 2 simply seems to forget it’s a comic book movie for long stretches. It doesn’t help that its narrative fails to go much of anywhere. Rather than give us a strong tale, it feels like a collection of subplots. We see Hammer’s pursuit of profits, Tony’s illness, the government’s use of the suit, and Vanko’s quest for revenge, but none of these come across as substantive in their own right. They fill time but don’t do much to involve the viewer. Vanko also creates a mediocre villain. For the second straight movie, Iron Man must battle a baddie with powers close to his own. 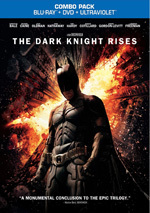 I wasn’t wild about that choice in the first flick, but a second go-round with a similar opponent feels uninspired. How hard could it be to put Iron Man against someone who doesn’t just seem like a variation on that character? In the prior movie, I felt director Jon Favreau was more at home with the comedy than with the action, and that seems even more obvious here. At least the story of Iron Man forced Favreau into drama, but this one – even with themes of terminal illness and revenge – prefers comedy. Occasionally it veers into more serious territory, but it usually opts for laughs. Some of that comes with the lead character, as the movies want to paint Stark as a glib, smart aleck personality, so we’re not going to indulge in considerable moments of seriousness. Nonetheless, I could live without the movie’s near-refusal to embrace darker moments. Maybe it doesn’t need to be as serious as the Chris Nolan Batman trilogy, but at least give us actual superhero material; Iron Man 2 feels like a slow build-up toward a payoff that takes far too long to arrive. When the film does reach its final act – and hoped-for action climax – it provides serviceable excitement, but it seems like too little, too late. Iron Man 2 feels like it exists to create a sequel, not to tell a story or advance characters. That leaves it as a spotty disappointment. Footnote: as always with Marvel movies, stick around through the finish of the end credits for a bonus clip. 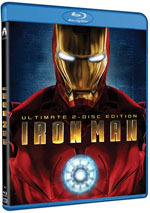 Iron Man appears in an aspect ratio of approximately 2.35:1 on this Blu-ray Disc. This became a good but not great presentation. Sharpness looked solid. Wide shots could be a smidgen soft at times, but those instances remained rare, so the majority of the flick was accurate and distinctive. I saw no signs of jaggies or moiré effects, and no edge haloes appeared. Source flaws also failed to become a factor in this clean presentation. In terms of colors, the flick went with a moderately stylized set of tones. Hues tended to favor either cool blues or subdued ambers. Within those parameters, the tones looked positive. Blacks were dark and firm, but shadows could be a bit dense at times. Though most of the low-light shots seemed positive, a few were a little too opaque. This was especially true during interiors that involved Vanko; those could be a bit murky. I still liked the image enough for a “B”, but it wasn’t a killer presentation. I was more excited by the movie’s aggressive DTS-HD MA 5.1 soundtrack. Despite the movie’s relative lack of action sequences, the audio used the five speakers to create a solid sense of environment, and when it needed to come to life, it did so in excellent fashion. The set pieces boasted intense material in all the channels, and those elements meshed together well. Everything kicked into higher gear to give us a bold, dynamic soundscape. Audio quality worked well. Speech was distinctive and natural, without roughness or other issues. Music seemed bright and peppy, while effects were a highlight. Those elements provided solid clarity and accuracy, with tight low-end and no distortion. The audio added a lot to the experience. On this single-disc Iron Man 2, we find a smattering of extras. These open with an audio commentary from director Jon Favreau. He delivers a running, screen-specific look at story/character subjects, stunts/action, effects, editing and deleted scenes, music and some other topics. On the positive side, Favreau provides an active, engaging presence who shows a fun personality, and we learn a decent amount about the film’s creation. On the negative side, however, he often does little more than just narrate the movie. We get enough useful material to make this a worthwhile listen, but it still comes with some blah moments. Under SHIELD Data Vault, we get an interactive supplement. You can view this as a “pop-up” mode that accompanies the movie or check out the features in a separate domain. Because I hate to find interruptions during a film, I selected the latter and found a mix of components. 15 “2D Scans” offer material that would show up on top of movie scenes. These give us brief close-ups of tech items and/or additional details about various concepts. These add some interesting factoids and views. “Personnel Dossiers” give us biographical data about 21 characters, while “Howard Stark’s Lock Box” lets us take a close look at the items left behind by Tony’s pop. Finally, we locate five “Case Files” with added info about “Project: Iron Man”, “Project: New Mexico”, “Avengers Initiative”, “Super Soldier Initiative” and “Missing: Bruce Banner”. The interface for the “Data Vault” can be clunky, but it offers a nice array of materials. The disc finishes with Previsualization and Animatics. This presents a mix of storyboards and animatics as a running feature over the movie. I’m not wild about that method – like I said, I don’t like elements that interfere with the film – but it’s still a potentially fun option. While I wasn’t a huge fan of the first flick, at least I enjoyed it. Unfortunately, Iron Man 2 provides a wholly lackluster sequel; it bogs down in too many meandering plot points and makes the audience wait too long for its action. The Blu-ray presents good picture and excellent audio along with a few decent bonus materials. Perhaps Iron Man 3 will redeem the franchise, but Iron Man 2 disappoints.